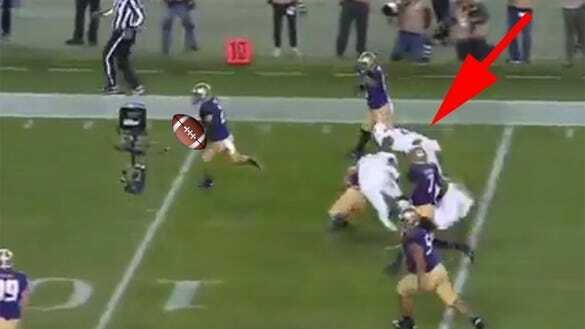 Washington linebacker Psalm Wooching managed to run across the field and knock down three Colorado players at once to clear the way for his teammate, Taylor Rapp, who had just picked off a pass and ran 35 yards to score a touchdown to start the second half. See, at first it looks like there’s no way Rapp can score off this – look at all the white jerseys! Then, suddenly all the white jerseys are in a pile on the ground. After the score, Wooching and Rapp were able to celebrate together. Great work, guys.